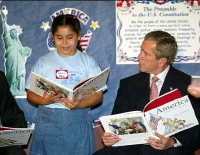 The original version of the photo (bottom) was taken in the Summer of 2002 while Bush was visiting George Sanchez Charter School in Houston. It was distributed by the Associated Press. 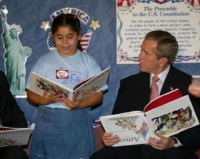 Dubya, Willya Turn the Book Over? Wired.com.